Guard against unexpected power loss with NFPA® online training addressing NFPA 110 and NFPA 111 requirements for Emergency Power Supply Systems (EPSS) and Stored Emergency Power Supply Systems (SEPSS). Emergency and standby power systems, generators, and stored electrical energy emergency and standby power systems are critical -- especially where power disruptions could interrupt building safety systems or compromise safety to life. 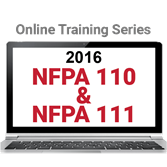 This interactive new online training series from NFPA® addresses how to implement requirements in NFPA 110: Standard for Emergency and Standby Power Systems and NFPA 111: Standard on Stored Electrical Energy Emergency and Standby Power Systems. Work at your own pace through three in-depth online modules addressing a broad range of topics related to EPSS and SEPSS. Developed by industry experts, this self-guided series helps you understand how to navigate, apply, and enforce requirements. Complete this three-hour course series and qualify for 0.3 CEUs. Completion of each individual one-hour course qualifies you for 0.1 CEU. Upon successful completion of a course or the course series, participants will be prompted to download the CEU certificate directly from the course site. This new online course from NFPA® gives you a solid introduction to NFPA 110: Standard for Emergency and Standby Power Systems and how this important Standard relates to other codes. Working at your own pace, you'll learn about NFPA 110 requirements, along with the components of an EPSS system, and how these types of systems safeguard buildings against power disruptions. This self-guided course helps you understand how to navigate, apply, and enforce requirements. Complete this one-hour course and qualify for 0.1 CEU. Upon successful completion of a course or the course series, participants will be prompted to download the CEU certificate directly from the course site. Learn how to conduct effective ITM using NFPA 110: Standard for Emergency and Standby Power Systems. Inspection, Testing, and Maintenance of Emergency and Standby Power Systems (EPSS) focuses on ITM activities based on the 2016 edition of NFPA 110: Standard for Emergency and Standby Power Systems. Working at your own pace, you'll learn about NFPA 110 requirements for installation, routine maintenance, and testing of an EPSS system, to gain confidence that every system is functioning as intended. This self-guided course helps you understand how to navigate, apply, and enforce requirements. Learn about the special considerations relating to SEPSS in this online course covering NFPA 111: Stored Electrical Energy Emergency and Standby Power Systems. NFPA 111 compliance is vital anywhere continuous emergency power is required or a loss of power is unacceptable. This NFPA® online training course introduces the key requirements in NFPA 111: Stored Electrical Energy Emergency and Standby Power Systems and covers how the Standard relates to NFPA 110 and other codes. Working at your own pace, you'll learn about NFPA 111 requirements for SEPSS, and be ready to identify system components along with installation and maintenance requirements. This self-guided course helps you understand how to navigate, apply, and enforce this vital Standard.